[3 Kinds Of Time Setting] ∞ seconds, 60 seconds or 120s no pain mode, meeting your different need for curing time. 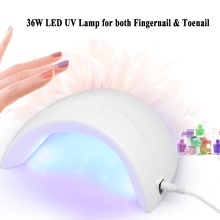 [Helpful For Drying All Nail Gels] Double light source from 12 LED lights, suitable for drying UV Gel/Builder/LED Gel. [USB Charging] convenient to carry and use, you can connect it to your power bank, computer or any devices with USB port. [Lightweight] Lightweight and portale, convenient for anywhere carry.